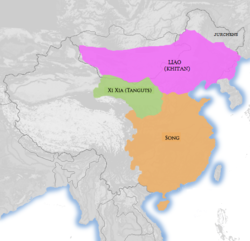 The Wastren Xia (tradeetional Cheenese: 西夏; ; pinyin: Xī Xià; Wade–Giles : Hsi Hsia), an aa kent as the Tangut Empire an tae the Tangut fowk an the Tibetans as Minyak, wis an empire which existit frae 1038 tae 1227 AD in whit are nou the northwastren Cheenese provinces o Ningxia, Gansu, eastren Qinghai, northren Shaanxi, northeastren Xinjiang, soothwast Inner Mongolie, an soothernmaist Ooter Mongolie, measurin aboot aicht hunder thoosand squerr kilometers. ↑ Stein (1972), pp. 70–71. ↑ Wang, Tianshun [王天顺] (1993). Xixia zhan shi [The Battle History of Western Xia] 西夏战史. Yinchuan [银川], Ningxia ren min chu ban she [Ningxia People's Press] 宁夏人民出版社. ↑ Bian, Ren [边人] (2005). Xixia: xiao shi zai li shi ji yi zhong de guo du [Western Xia: the kingdom lost in historical memories] 西夏: 消逝在历史记忆中的国度. Beijing [北京], Wai wen chu ban she [Foreign Language Press] 外文出版社. ↑ Li, Fanwen [李范文] (2005). Xixia tong shi [Comprehensive History of Western Xia] 西夏通史. Beijing [北京] and Yinchuan [银川], Ren min chu ban she [People's Press] 人民出版社; Ningxia ren min chu ban she [Ningxia People's Press] 宁夏人民出版社. This page wis last eeditit on 3 Mairch 2018, at 14:32.